Colonel Mustard vs. Doctor Lucky: Fight! The quality of games has definitely improved over the last few decades. As a matter of fact, if you didn't believe that, you probably wouldn't be reading this blog. You'd likely just has a beaten-up copy of Monopoly, a backgammon set and a chess board that got pulled out every now and again. That's not to say that the truly classic games are bad... they're classic for a reason. Most of them, anyway... some of them *cough*Monopoly*cough*cough* just need to find a recycle bin. Others, though... they're definitely fun. But how do they stand up to newer ones with similar themes? Today, I'm comparing the classic Clue (1949, Anthony E. Pratt) to Kill Doctor Lucky (1996, James Ernest). "Why compare the two? ", those of you who have played both might ask, "Those are completely different games!". That is indeed true. They're definitely very different mechanically. But we're going with theme, and viewing this through a lens of "the old vs. the new". Clue... if it wasn't for the fact that I didn't play it until I was an adult, I would more or less assume that everyone had played it. The game isn't that difficult. You are dealt character cards, weapon cards and room cards. One character card, one weapon card and one room card are put in an envelope. Players make accusations of characters, saying so-and-so killed poor Mr. Boddy (Dr. Black in the original UK version) in this room with that weapon. The players then go around clockwise, and are given the option to reveal one of the cards in the accusation... which proves that since it is not one in the envelope and cannot be involved in the murder. It's a fun game. Solve the murder! Bring that dastardly villain to justice! Kill Doctor Lucky, on the other hand... it kinda tells the same story, but from a different perspective. The characters all have grudges against the bumbling but irritatingly felicitous Dr. Lucky. And everyone wants to be THE one to kill him. The way it works is that you have a hand of cards. Some will be Failure cards (with a numerical value), some will be weapons (also with a value) and others will be room cards, which you play to move your character or Dr. Lucky to the specified room. The idea is that you want to get Dr. Lucky into a room out of view of the other characters, preferably with a weapon (though you can try without one) and try to do the deed. Once you do that, you add the point value of the attempt. Then, going clockwise, players may play Failure cards to stop the attempt, trying to match the value of the attempt. If they don't play enough, you win. But most likely, that old guy will slip through your fingers. Eventually, though... players will end up being too greedy in hoarding their Failure cards, or will just have ran out. And that is that. So... which is better? I dunno. They're both pretty good games. Kill Doctor Lucky certainly appeals more to my sense of humor, I'll admit. How cool is it that you are setting yourself up to be that guy revealed on the last page of that novel? It should be worth noting, however, that the game has spawned a term... the infamous "Kill Doctor Lucky Syndrome". Basically, this is where a mechanic depends on players being called on to spend finite resources to prevent another player from winning. Specifically, when this goes arouynd the table in a specific order, and the person at the end of the line is expected to contribute more than the others, which pretty often can result in that player not being able to contribute enough and player greed handing someone the win. Some people get SO mad! It's pretty amusing. That's it. 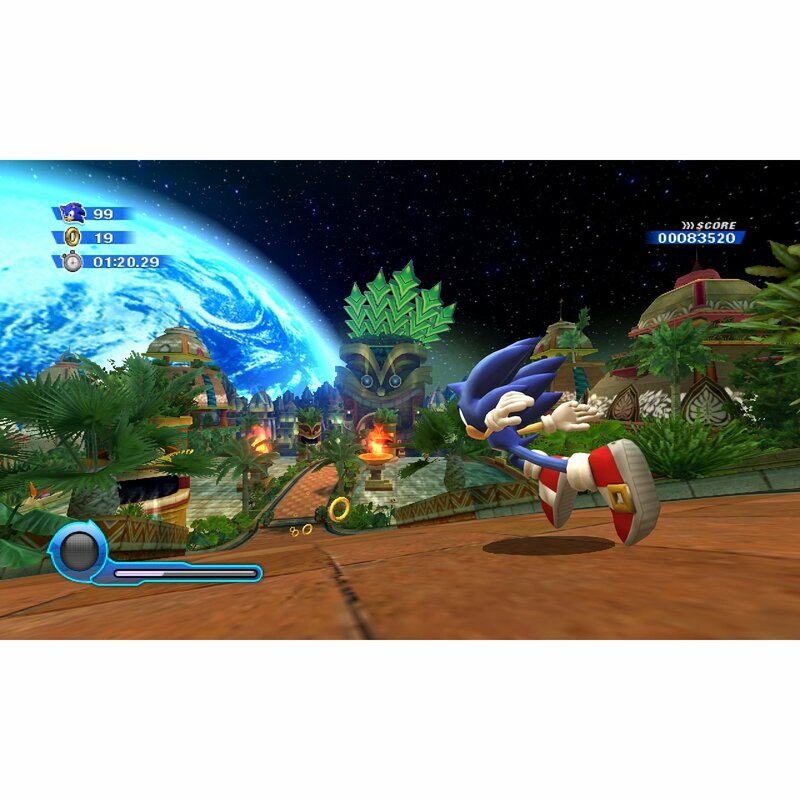 Do you ever compare older games with newer ones? Have couple you'd like us to look at? Let us know! And don't forget to check out what Julian over at Cool Factor 5 has to say on the "old vs. new" subject; this was another of our blog challenges. Over the last couple weeks, I have had a few interactions with the customer service people for several game companies. Invariably, I have been treated very well and received prompt replies. I think that it reflects well on the industry that companies are eager to keep us, the gamers, happy. So let me share a little with you. Over the 8-1/2 years my wife and I have been together, we have bought an enormous load of games. That's what we do. Some people go clubbing, some people take frequent little vacations... we game. And we love it. But back to the point, we have bought a lot of games. And until a few weeks ago, we haven't had any issues with components. Our copy of Wits & Wagers Family had a single wet-erase marker that didn't write. We were able to play the game fine, it's just that we didn't have had a marker for the fifth player. This did indeed come up in our first game. I contacted the company, and a nice fellow by the name of Andrew contacted me very quickly. He explained that there was a defective batch of markers. I received a set of replacements, plus a couple extra cards for the standard version of Wits & Wagers. Top notch service, guys! Our Christmas present to ourselves, Neuroshima Hex!, suffered from having a board that had an extra slice through the middle. After the first play, we had a sliver of the board between the standard middle fold of the board and this cut (probably 2-3mm wide)peel off, leaving a noticeable eyesore. My wife contacted Z-Man Games, and Zev (the Z-Man of Z-Man!) contacted her personally to address the issue. Within a few days, we had received a new board. Thank you, Z-Man! Gamewright publishes, among other things, Forbidden Island. If you haven't tried it, please do! Expect a review from us soon. Anyway, upon opening the tin, we found one of the island space tiles, the Whispering Garden, had a tear across it. Since their tiles are prepunched, it likely happened when it was separated from the boardstock, since sometimes the paper top hangs to the sprue. Upon being contacted, Gamewright immediately sent a replacement. I would like to thank Emily, the woman who handled my issue. Thanks! Yesterday, we picked up Ascension: Chronicle of the Godslayer from Gary Games. As with Forbidden Island, definitely expect a review of this game. We found upon opening that we were missing one of the Apprentice cards. These are particularly important because they make up your starting deck. It hasn't yet come up, but that makes it unplayable for four players. It's a bit preemptive for me to discuss their customer service, but I have sent a message to them and am awaiting a reply. I fully believe that they'll do the industry proud and ship out a replacement card soon. Update: Replacement card received, plus a promo! Thank you! So... that is that. I wanted to thank the customer service people at these companies. Way to go. So... of all the luck, eh? It is truly bizarre that after buying so many games without issue, that four in a row have either missing or defective parts! Crazy! Our First Guest: Uncle Rob! A few weeks ago I promised Katie-bird that I would write a short post about my favorite game and at the time I'm sure I was thinking about the game that I am currently enjoying very much: Lord of the Rings Online. But upon reflection of my life-long love affair with games I have came to realize that my current favorite game is not even close to my all time favorite game. Why? Well for one thing its not the game I like as much as it is my love of Tolkien's lore and the chance to dynamically experience Middle-earth, a world that I have been in love with since first reading The Hobbit some 35 years ago. I mean, I have been aware of MMO's since the early days, I have tried EQ, WoW and the others and because I have no interest or investment in the lore of those worlds I never played beyond the free trials. If you took LotRO and changed the story and stripped it of its Tolkien influence, I would drop the game in a heart beat - so how could that be my favorite game? So what is my favorite game? I am very tempted to award that dubious distinction to Dungeons and Dragons, which was after all such a big part of my teen and young adult life. I have very fond memories of all the time me and my brother Dave, spent designing dungeons and role-playing each other through those grand adventures . I can still see the delight and wonder of my wide-eyed niece, nephews and children as i ran them through their firsts adventures. But if you asked me to play it today - I would probably decline. Even though I occasionally consider picking up the dice and books and playing it again, It justs takes so much effort and investment of time that I just don't think I can make that much of commitment of my life as it exists today. So how could that be my favorite game? What game would I play without hesitation every time I was asked? That certainly must be my favorite game - right? Well – maybe, and maybe not. For example, me and my son Bryan are currently involved in a chess tournament, I'm not really that good and he beats me most of the time (which of course is followed up with much gloating, humiliation and shame) but i drop everything and play him 2 or 3 games every time he visits home and asks for a game. But chess is not my favorite game and I hate to lose. So maybe its pinochle, or spite and malice. Card games that I would play anytime, anywhere, anyplace. as long as its with my family - no. can't be because, honestly - I really hate pinochle. Well from these examples I'm starting to see a trend. Sure there are games that stimulate my intellectual curiosities and rev-up my imagination into overdrive, there are games that challenge me. And there are games that drive me bananas, Some games are just fun to play. Some, not so much, but the thing that really drives me is the time that I shared with my friends and family - I cant say the word "pinochle" with-out being flooded by a thousand and one memories of all the good times I have shared with my family playing that stupid game. D&D was all about sharing time and ideas with my best bro in the world and later sharing those experiences with my nieces and nephews and then much later my children. Beyond the Lore of Tolkien what really gets me to log on to LotRO is the time I share with my bro in that game - time and miles might separate us but through that game we are instantly 12 again and it is as if nothing ever changed. And even though we don't always play together we are both just a /send tell away. Is the one that I am going to play with you. I was first introduced to Dungeons and Dragons as an imaginative 5 (6 maybe?) year old by my ultra cool Uncle Rob. I think he was babysitting my cousin and I and I guess decided it would be fun to take us on an adventure. We were enraptured. We had the attention of a grown-up, fistfuls of dice, and got to use our imaginations. Win! Our games were really just interactive sotrytelling, and complex rules were not a part of it, but that is what made it so amazing for our young little minds. For years after we begged and begged Uncle Rob to play D&D with us at every opportunity, always wanting to "pick up where we left off". As we grew, our experiences deepened. More rules, more devious dungeons, cooler treasures. We got caught in an endless paradox due to a misuse of a Wand of Wishing. We went to "dinner" at Castle Ravenloft and met with Count Straud and his minions. We explored, we mapped out vast dungeons, we fought, we laughed, and we cried. We begged and pleaded and bargained for more more more. And then came the books! Rob started giving me my own D&D books. "Old" hand-me-downs as new editions came out were amazing and new to me. I would read and read and imagine all the worlds we'd "seen", and all the worlds still out there to explore. I would ponder over the maps and treasures and dream of grand adventures. A few years later, I had the good fortune to find myself living in the same town as my "favortie DM EVER" and he let me read all his books. Even the new ones! We started a little routine where we would walk down to the bookstore together and pick up the new Gazeteers as they came out. Gazeteers were supplements for the world of Greyhawk that were coming out in the late 80's-early 90's, and each one would be dedicated to a specific culture and region of that world. I remember excitedly looking at maps and pictures and talking about the history and culture of the various peoples of the world. The Elves of Alfhiem, The Grand Duchy of Karamekios, The Five Shires, Northern Reaches, Principalities of Glantri, The Dwarves of Rockhome... and many more. I think there were maybe 14 in all? Anyhow, this world came alive on the pages, and each new Gazeteer would bring hours of enjoyment and oodles of inspiration just in the reading of it. The thing I particularly liked about them was the focus on world-building, maps, and culture. Each one attempted to bring to light a unique region and it's people, and this felt like I was peeking into a living, vibrant world. In my opinion, they succeeded in a way in which very few since have. What I would like to see brought back into modern gaming is the wonder of exploring a new world through the pages of an ongoing world supplement. Give me rich histories, detailed cultures, more maps than I know what to do with, cities full of interesting and unique characters. 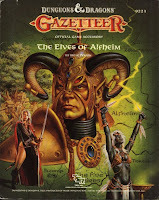 Each Gazeteer was like a piece of the world, and that sense of discovery and intrigue of each new one was one of the prime influences on the development of my own worlds and style as I grew up and learned to "play by the rules". It seems like to me that many game supplements now are focused so heavily on the rules and character builds and new player options and less on revealing a world bit by bit. The campaign settings I've read over the past 10 years or so seem to try to give so much and come in with such little depth. I'm sure some people love that, they have all thier own ideas of how to populate the world and it's denizens and don't want detailed in-depth cultures. For me though, I love it when a game product is focused on one thing; some great examples I can think of are Freeport, City of Adventure and Sharn, City of Towers , but those aren't ongoing series' that round out a world, those are supplements focused on exploring a single city. 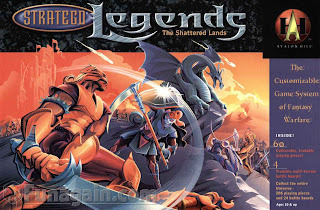 Althought they do that well, what I'd really like to see brought back into modern roleplaying games is an ongoing detailed, rich world that I can look forward to the next installment of. Something I could spend hours looking over maps and discussing histories of fantastic peoples. 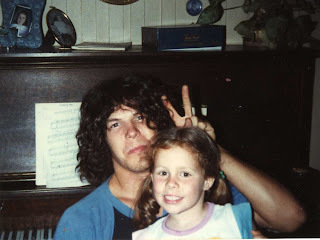 I really loved that experience of discovering a world with my Uncle Rob, (thanks for all the memories!) and can't wait to pass along those experiences to my own children. 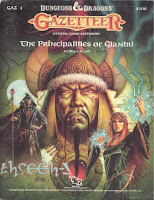 Although I've since taught many younger relatives how to play D&D and various off-shoots, I'm really looking forward to exploring new worlds with my own kids, and would love to have a series as detailed and diverse as the Gazeteers were 'back in the day' to discover with them. This post is part of an ongoing series of shared topics between our blog and Cool Factor 5, so pop on over and see what roleplaying game feature Julian would like to see brought back into games. And as always, feel free to leave a comment, share your experiences, ask questions, or just chat us up. We love you readers, share your thoughts with us!!! Hi! Today I've decided to share a little about one of our newest games, Neuroshima Hex by Z-Man Games. Angie and I have played this a few times since we gave this for ourselves for Christmas. That is a bit of a story alone! We had decided to allow ourselves one game for Christmas, but we were torn on what to get. On our list were Steam, Dixit, Neurosima Hex and the new Sid Meier's Civilization board game. We went back and forth on it, and came up with a plan on how to decide: we decided not to decide for ourselves... and get someone from our friendly local game store to choose for us. So... one of the joys of having a physical game store to walk into is building relationships. Our primary local game store is Evolution Gaming in Eugene, Oregon, where we live. We described our dilemma to one of the owners, and asked if he would be so kind as to make a choice. He looked at our list, and threw the game in a box as we meandered around the other side of the store. He later told us that he picked it based on what he knew we played. This is why local game stores are awesome. Or at least can be, when the people running it have the right attitude. Like at Evolution Gaming, or at Rainy Day Games in Aloha, Oregon. Anyway... the game. Of course he picked Neuroshima Hex. This made the list in part due to the iPhone app. My wife had been playing it on her iPhone for awhile and was intrigued by it. So she had a few plays up on me, which is fine. But just so you know, there's a cheap way to try it out... if you have an iPhone. Neuroshima Hex is a cross between an abstract area control game and a tactical combat game. Played on a hexagonal grid, you and your opponents are trying to destroy one another's base. You do this by playing tiles and attacking. Your turns consist of drawing tiles from your faction's supply until you have three, discarding a tile and then playing up to two tiles. Tiles are either going to be a unit, which typically has a melee or ranged attack value in certain directions, a module which gives bonuses to adjacent friendly units, and action tiles. 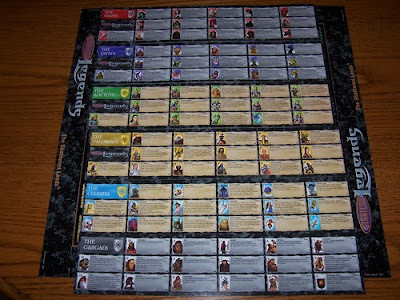 The primary type of action tile is an Attack tile, which you may play at the end of your turn to initiate a board-wide execution of all tiles' attacks according to their initiative value. All players' units participate. So positioning is everything. When you place a tile, you must consider its initiative bonus in relation to enemy units that are eligible to attack it. Your super melee unit may be adjacent to the enemy base, but it may not get to act before it is eliminated. There are a lot of considerations altogether, making this a very strategic game. In the base game there are four factions, each with a different flavor. It should be noted that there is a roleplaying game that this was based (called Neuroshima), and the factions draw from the post-apocalyptic world this happens in. One is a bunch of mutant brutes who melee well but lack range. Another focuses on range and mobility. One makes extensive use of modules, and the last is unit-heavy and spreads across the board easily. Pretty balanced. There are also two expansions that add factions to the base game, one of which (Neuroshima Hex! Duel) can be played as a stand-alone two player game. The verdict? We like this game a lot. It doesn't take long to play, and it is very strategic. There are a lot of considerations in the game. Playing the game just as a tactical game will get you stomped, but so will playing it as only an abstract area control game. We're very glad to have this game in our collection. And a note on customer service. the copy that we opened had a defective board. The board had an additional cut through the center, resulting in a sliver of the surface coming off almost immediately, showing the paperboard underneath. My wife contacted Z-Man and received correspondence from Zev (Mr. Z-Man himself! ), followed by a replacement board a few days later. We always appreciate when a game company provides great service. Thank you, Z-Man! I hope you guys enjoyed this. Have you played this game? Or the Neuroshima Duels? Let us know what you think! And also check out Cool Factor 5 and see what Julian is playing! That pic mostly just shows the board games. There's "RPG overstock" on the bottom middle shelf, though our favorite/heavy rotation are on another bookshelf. Or were... before the shelf broke under the weight (yes, I'm being serious!). Also, in the bottom left, you can see some drawers. This is where we keep our card games, playing cards, dice, and random gaming bits. See stuff you like? Recommendations for additions? Pics of your own collections? Let us know! I am writing a short blog post this time because some games don't involve as much. They're easier to explain. We'll call these writings Quick Reviews because I'm giving you my opinion fast and they aren't so long. Sonic Colors is a great game for the Wii. Mommy was playing it and it made her head hurt so I got to play it instead of her. I actually like this game because it's all about a guy who jumps and runs really fast. It's really cool because there are all these circles everywhere and all these mystery things and I get to collect them. These important things along the way have a little voice that tells me what I can do, so that's how I learned to play. I like it because it's so fast and I'm good at it. I love it, I want to play again. It's awesome. And it doesn't make my head hurt like it does to my mom, so that's good. Everybody who likes games where you go really fast should try this game. That's all, thanks for reading! Flashback: I pick up the 3rd Edition D&D Player's Handbook. I had been on a bit of a hiatus from roleplaying games after moving to Oregon to finish college. I played 2nd Edition extensively in high school, and after moving away for college, I played sporadically when it came up. I even started a short-lived but fun campaign as the Dungeon Master. I decided to pop into my FLGS (Friendly Local Game Store) and check this out. I was not disappointed. At first, I was pretty thrilled by the announcement. I was pretty happy with the direction of the product line thus far, and was excited to see where they would take it. After all, they'd really made it shine, they're just going to do more of the same, right? Wrong. I started being skeptical when Wizards of the Coast started giving previews. I just didn't feel behind what they were doing, but I still kept reservedly optimistic.But each subsequent preview made it really seem that something was not going right, in my opinion. And then it was released. I'll admit, I went to my FLGS to pick it up at midnight. Yup, I'm a geek and not ashamed to admit it! So, I'm not going to review 4th Ed. I'll just say that I was unimpressed by character creation, and the fact that every character class pretty much does the same thing with slightly different window dressing. It wasn't ever, "What's YOUR cool power? ", it was always "What's your 3d6 + ability modifier power?". Basically, they're all the same. At least it seems like that to me. Feats are also stripped of all flavor. And the archetypes and pretty rigid, backsliding to 2nd Edition. Among other things. All in all, it seems like a pen-and-paper MMORPG (Massively Multiplayer Online Roleplaying Game), probably by intention. Another point of note was the Gaming System License (GSL) for 4th Edition. Whereas the OGL was very permissive and encouraged third parties, the GSL did everything it could to say that Wizard of the Coast could terminate your rights to publish 4th Edition-compatible material at their whim. It is very restrictive, though there are quite a few third party publishers who do use it. I'm not impressed with it, though. And, as I understand, the GSL itself exists only because a lot of people pushed Hasbro (Wizards' parent company) really hard. So... yeah. This post isn't really about bashing 4th edition, Wizards of the Coast or Hasbro. I just wanted to convey my disappointment about the system, as compared with my previous experiences. I have played 4th Edition a bit, and enjoyed it; it's just not what I want to spend my small amount of roleplaying time playing. I've chosen to look to the Pathfinder line by Paizo Publishing as my RPG of preference. To put credit where credit is due, Pathfinder is based on the 3rd edition OGL. I recommend checking this system out if you haven't already. Do you have a big gaming disappointment? Misery loves company! Share it with us! And also, check out what Julian has to say at Cool Factor 5! 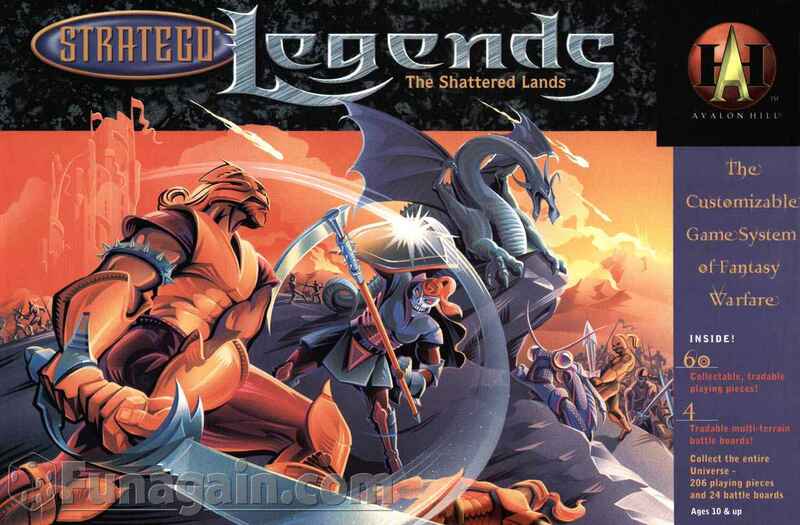 The idea for today's post is to highlight a game that I have enjoyed that really obscure or at least not very popular. Since I don't know exactly who will be reading this, there's a chance you've heard of and/or played this game but the goal is to bring to light and talk about something off the radar for many of our readers. Every once in a while my friend Julian (yes, the same one from the Cool Factor 5 blog!) decides to get rid of some games. I am sometimes the lucky recipient of the games from these purges, and I've found myself on several occasions with a really awesome new game to enjoy. 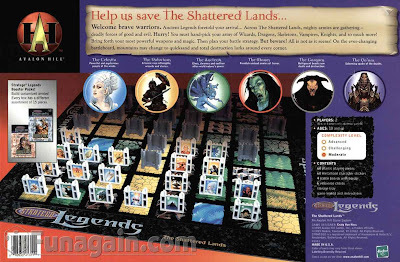 One such purge several years ago landed us a set with a couple of copies of Stratego: Legends (and possibly several boosters?) on our game shelf. Stratego has never really been a game I get too excited about, but the cool fantasy art and customizable aspect of this set intrigued me. The biggest deterrant from playing this game is the constant need to check and re-check the reference cards to figure out what all the pieces do. I prefer games with the text right there on the cards of pieces, or with easy to reference keywords (and even symbols). I would not likely list this among my favorite games, but it was pretty cool for a slightly obsure title that I stumbled upon. If you have an opportuntiy to check out this game (if a friend has it or you see it as a super deal at a garage sale or thift store) I recommend giving it a try. Lots of possibility, a fun twist on a familiar game, and a decent amount of strategy and manuevering considering the reasonable playing time. Have you played this? What game do you love that you think we've probably never tried? Give us some ideas! Also, this is another in the ongoing series of challenge posts, so be sure to check out Julian's ideas about an obscure game over at Cool Factor 5. After all, it was thanks to that guy that we discovered this game in the first place. Thanks J! So, it's about that time of year to blog about the games we got for Christmas! Today, I'm talking about Wits & Wagers Family, a simplified, family-friendly version of Wits & Wagers. My wife and I like the standard edition of Wits & Wagers quite a bit. It is a simple and fun trivia game that you don't really need to know trivia to play. The way this works is that each player (or team of players) has a card, a wet-erase marker and a pile of poker chips. A question is read aloud, to which the answer is a number. Each player or team writes down their guess on their card, and then all the cards are arranged from high to low on a felt play mat. Position in relation to the median bet determines the odds and the payout for a correct answer. And then everyone bets on what they believe to be the correct answer with their poker chips. Then the answer is read, the correct guesser is given a small payout, and then correct betters are paid out according to the odds. There are seven rounds, and all but the last round have betting limits. Pretty simple, right? The standard version of Wits & Wagers is fairly simple for adults, and, as per the box, can accomodate up to 21 people (assuming seven teams of three, since there are only materials for seven). As with any betting game, it favors those who play the odds and are somewhat savvy to those kinds of systems. It is a great game for adults. We can get non-gamer friends to play this and enjoy it every time. But it isn't the best for kids. Wits & Wagers assumes an understanding of risks versus payouts that most people of age teen and above are likely to have acquired, but not younger kids. Also, when you bet chips and guess wrong, you lose them. In a trivia-based game, kids are already at a bit of a disadvantage for not having the breadth of knowledge an adult does... so losing your cool stuff on top of that can seem mean to the younger ones. Those reasons, as well as the nature of the trivia questions themselves, make the standard version somewhat inaccessible to kids. Enter the family version. Wits & Wagers Family streamlines this. The questions are things children are more likely to have encountered, but still challenging to them and adults. Betting is simplified to using meeples. Each player has a large meeple and a small meeple, and there is no odds track with different payouts. The game plays as above, but you score one point for a correct answer, one point for betting on the correct answer with your small meeple and two for your big meeple. So you will score 0-4 points in a turn. The score is tallied on a score track, and the game ends when a person gets to fifteen points. Much simpler. I personally favor the family version of Wits & Wagers over the standard version. It is far more accessible to children, and we have successfully played it three times already with our five year old daughter, Katie. She has had a blast, and was able to be competitive. The questions are still challenging, and there will still be a range of answers each question. I highly recommend this game. Even for adults. Quick to learn, quick to play. Even for non-gamers. And, as an aside, I need to mention Northstar Games' customer service. After we started playing the game, we noted that one of the wet-erase markers would not work. I contacted the customer service department through the email listed on their site and received very prompt service. As a matter of fact, in addition to receiving a whole set of the markers, they threw in a couple extra cards for the standard edition, possibly a convention-only thing. I was very impressed. I like it when a game company takes their customer service this seriously. Katie says: Wits and Wagers Family? It's awesome! I like that you get to have you card and write different numbers based on the questions. Our whole family can play! I like ot keep score for myself by making X's. 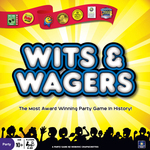 Angie says: I think Wits and Wagers Family takes all the best parts of the original Wits and Wagers game, simplifies it so that kids and non-gamers can enjoy it without losing the charm, and adds an interesting mix of questions that are a little more accessible to a range of players. A question about how many Disney Princesses there are had us all scratching our heads and counting them up, while Katie smiled as we discussed a favorite topic of hers. Although some of the questions were pretty easy, it's fun to know stuff and be right so I don't mind. Plus there's always the uncertainty and consideration when other people answer differently... did I remember that right? Who should I bet on? We were able this game to play this game at a busy family gathering and had various family members of all ages joining right in and playing along, without any hesitation or confusion about the rules. Answer the question, place your meeples, mark your points. Easy, streamlined, and fun. Love it! There aren't as many questions as the original, but I can't see why I would ever go back. I think we could use the original game questions with the user-friendly scoring from Wits and Wagers Family and extend the length, but honestly I'll probably be keeping my eye out for an expansion! 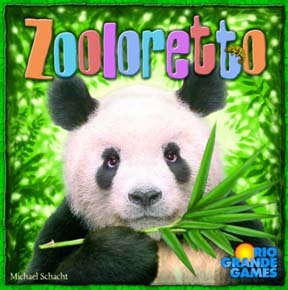 Zooloretto is awesome. It’s a game about animals and barns and building a zoo. The art is really cool. I liked all of the animals, I don’t even have a favorite because they are all good. 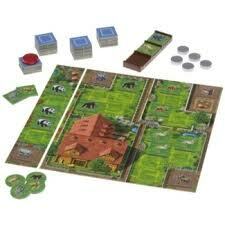 It’s a very very good game because it involves getting money and building the best zoo to win. How to play: First out you start with 2 coins and then as you play you fill up your zoo more and more. And also, when you get one in your barn you risk losing a lot of points. Like if you had 900 in your barn at the end that’s bad. They go in your barn if you dont have any open pens when you take animals off a truck. How you get stuff in your zoo is you draw a tile and put it on the truck, then on another turn you can add another tile or take a truck. If everyone else already took one then its just you who gets to pick if you want to add more tiles until there’s three. Then you put the trucks back and start the turns over. When you draw a tile that’s money and you take the truck it’s on then you get another money in your pile. You use your money to move tiles or exchange places of your tiles and that costs 1. You can buy a tile from someone’s barn or get rid of one out of your barn for 2 money. With 3 you can expand your zoo so you can get more different animals. That’s the coolest thing to spend your money on. When you get animals they can’t just go wherever, they have to be with the same type of animal. When you get a boy and a girl together, then they have a baby animal. How you win is when you get the most points. A whole bunch of points. You get points for filling up the squares of animals. Like if you fill up the one with 5 animals you get 8 points. You also get points for the stalls, they give you 2 extra points for each kind. What I like best: Getting another pen. And getting more money. What I like least: The thing I liked the least is not winning. And getting animals in my barn since that risks some of your points. 3 kinds of animals in your barn loses 6 points! What is hard: The hard part is, well, none of it is hard. I mean choosing a tile is hard since I want to do this one, no that one, no… every pile. Its hard to choose. What is easy: The easiest part is choosing a truck. The ones that you should pick the most is the ones with the stall since they are worth 2 points! How much I like it: 120-190-106-105. That’s all. That means I love it almost as much as Settlers of Catan. To all you blog readers: Everybody should play this game. Leave me a comment about the game if you've tried it, or you can ask me questions. I know all about it. Also, I love you! Introducing Our Expanding Universe! This is a new segment we’re testing out in which we talk about expansions for games that we play. Expansions enhance the way we enjoy games, and are worth talking about in their own right. Hello! Welcome! This post is going to launch a new post category for our site. Our Expanding Universe articles are going to cover expansions for games. A lot of games are seeing expansions added, and many of these launch with expansions planned for years ahead. Some are good, others not... but you know this. Today, I'm going to talk about a game that I will not play without an expansion. That game is Race for the Galaxy. The expansion to this game I cannot play it without is The Gathering Storm (TGS). TGS is the first of three expansions for the game. As expected, it adds a few cards to the pretty large amount in the base game. These cards are pretty well balanced and fill thematic and mechanical "holes" in the base game. For example, some cards have keywords that can be relevant when scoring happens. This adds more of those cards, which allow more interesting combinations. What really stands out, however, are the goal cards. The goal cards are a set of goals that are randomly dealt out each game. Two large goals each worth five victory points and four small goals each worth three are in each game. The large goals function like the Longest Road/Largest Army cards in Settlers of Catan, in that they can change hands during the course of the game. One is for largest military, for example, and another is for largest number of large developments. The small ones are for the first person to reach the goal. These add some serious considerations for gameplay, since sometimes a few points can be the difference in first and second place in scoring. And if your draws aren't getting you the planets types you want, you can try focusing on the goal cards so that you're earning points while you're waiting to draw the next rare minerals world, or big development. To summarize, I wouldn't play RftG without this expansion. The other two expansions don't seem as critical, as I can easily see playing without the additional rules from the Rebel vs. Imperium or Brink of War expansions (Prestige points and takeovers come to mind). This expansion really made Race for the Galaxy a better game. So, if you own the game, try this expansion if you haven't already. And share your thoughts! Tell us what you think of this expansion, or any other expansion for any game you cannot see playing without! This post was another is our series of challenge posts with the gaming blog Cool Factor 5. Be sure to check out what he has to say about an expansion he thinks is an absolute must! Last night Jack watched me play a game with Katie. He sat there having a snack and watching in a pretty mellow way for such a boisterous little boy. When we were done we cleaned up the game and I started getting ready to go run an errand when I felt a little tugging at my leg. I look down and Jack is looking up at me with big eyes, and says "Game! Turn?". It totally melted my heart, and I stopped what I was about to go do to get out a game and play with Jack. After all, my beaming little just barely 2 year old waited patiently and asked so politely, with such a look of expectation and hope on his little face... what else could a mommy do? I grabbed Boggle Jr . off the shelf, thinking we would just roll the letter dice around and look at the pictures on the sturdy cards. The first thing he did was get out some cards and proceed to tell me what the pictures were. "Cat", "Dog", "Shirt", "Car", "Two" (It was a five, but good try buddy!) Then he surprised me, he took the letter dice and instead of tumbling them around or throwing them on the ground, he looked at all of the sides and carefully picked some to display. Then he looks up at me and says "Word!". What?!? I look and the "word" he spelled was "ROLU". Then he looks at me and waves his arm across the tray and says "Read, Momma!". It was one of the highlights of my week, such a rich interaction with my little guy, and it just made me smile and feel all warm-fuzzy proud inside. We played for a few more minutes, then he helped me clean up and put the game away before he toddled off with Elmo and a smile on his face.